You will be responsible for coordinating and implementing marketing initiatives in support of direct marketing, advertising and promotional programs. You will be expected to work with marketing managers to implement marketing plans aimed at building patron loyalty and increasing ticket sales. Activities will include writing promotional copy; liaising with external organizations on promotional relationships; selecting prospects from the Festival’s database & compiling targeted lists; setting up and deploying email; coordinating mailings; planning and implementing promotional events and preparing flyers, posters and inserts in coordination with our graphic design studio. Experience using a customer relationship database and e-mail system (ie Tessitura and mail2) is a mandatory qualification. You must demonstrate excellent written and verbal communication skills, strong analytical skills, and a proven marketing background. The ability to manage multiple projects is important. A creative flare along with a passion for the arts is necessary. This is a one year contract which reports to the Associate Director of Marketing. Reporting to the Production Stage Manager, you will provide organizational and administration support to the stage management office. This position will appeal to someone with a strong desire for a career as an Equity Stage Manager. Strong organizational and exceptional interpersonal and communication skills are essential. Formal training in theatre production together with stage management experience is necessary. Past experiences should reflect a strong interest in the arts. Proficiency in Word and Excel and the ability to quickly learn the theatre’s own scheduling program are required. These are seasonal positions, contracted for between three and eight months, depending upon which stage management office the production assistant supports. Only those we wish to interview will be contacted. July 5, 2013… The Stratford Festival is pleased to welcome back Toronto Star theatre critic Richard Ouzounian for a second season of Star Talks in Stratford. The four-part interview series begins this Sunday, July 7, in the Festival lobby, with an interview following the matinee of The Three Musketeers with cast members Graham Abbey, Jonathan Goad, Luke Humphrey and Mike Shara. Offered as part of the new Forum, a series of activities and events designed to make a visit to Stratford an immersive, all-encompassing cultural experience, Star Talks gives patrons an exclusive opportunity to get to know the productions through some of the Festival`s most entertaining artists. This Star Talk is open only to patrons attending the matinée performance of Waiting for Godot. Support for the inaugural season of The Forum is generously provided by Kelly and Michael Meighen and the Province of Ontario, in partnership with the University of Waterloo, with media sponsorship provided by The Walrus. Support for the Speakers Series is generously provided in memory of Dr. W. Philip Hayman. The Festival’s new Toronto bus service Stratford Direct is now available twice daily on performance days for only $20 return. Reservations can be made through the box office. Support for Stratford Direct is generously provided by The Peter Cundill Foundation. The Stratford Festival’s 2013 season runs until October 20, featuring Romeo and Juliet, Fiddler on the Roof, The Three Musketeers, The Merchant of Venice, Tommy, Blithe Spirit, Othello, Measure for Measure, Mary Stuart, Waiting for Godot and two new Canadian plays, Taking Shakespeare and The Thrill, along with more than 150 Forum events. June 11, 2013… The Stratford Festival is extending the season at the Tom Patterson Theatre, adding performances of , Mary Stuart, Measure for Measure and Waiting for Godot, all of which have been experiencing extremely strong sales. September 25 at 8 p.m.
September 27 at 8 p.m.
September 28 at 2 p.m.
September 25 at 2 p.m.
September 28 at 8 p.m.
September 26 at 2 p.m. Described as “electrifyingly entertaining and intellectually exciting” by the Toronto Star’s Richard Ouzounian and “edge-of-your-seat suspenseful” by The Globe and Mail’s J. Kelly Nestruck, Mary Stuart is directed by Antoni Cimolino, whose production of Cymbeline was one of the most in-demand tickets of the 2012 season. It features Seana McKenna as Elizabeth I and Lucy Peacock as Mary Stuart. “This is one for the memory books, with two remarkable actresses at the peak of their powers,” says Postmedia’s Jamie Portman. “A production that most definitely puts the class back in classical theatre,” says Sun Media’s John Coulbourn. Measure for Measure, directed by Martha Henry, features “a crowd of good performances,” says the National Post’s Robert Cushman, adding: “You couldn’t hope to find better acting, directing or writing.” This production, defined as “a stunner” by Lynn Slotkin, of The Slotkin Letter, features Carmen Grant as Isabella, Stephen Ouimette as Lucio, Tom Rooney as Angelo and Geraint Wyn Davies as Duke Vincentio. “The cast is exceptional down through the smaller characters,” says The Globe and Mail’s Nestruck. Waiting for Godot, directed by Jennifer Tarver, and featuring Brian Dennehy as Pozzo, Stephen Ouimette as Estragon and Tom Rooney as Vladimir, with Randy Hughson as Lucky, is one of this season’s most anticipated productions. It starts previews on June 13 and opens June 27. Support for the 2013 season of the Tom Patterson Theatre is generously provided by Richard Rooney and Laura Dinner. Production support for Measure for Measure is generously provided by Karon Bales & Charles Beall; for Mary Stuart by Dr. Dennis & Dorothea Hacker, Drs. M.L. Myers & the late Dr. W.P. Hayman, Alice & Tim Thornton and Diana Tremain; and for Waiting for Godot by Sylvia D. Chrominska. 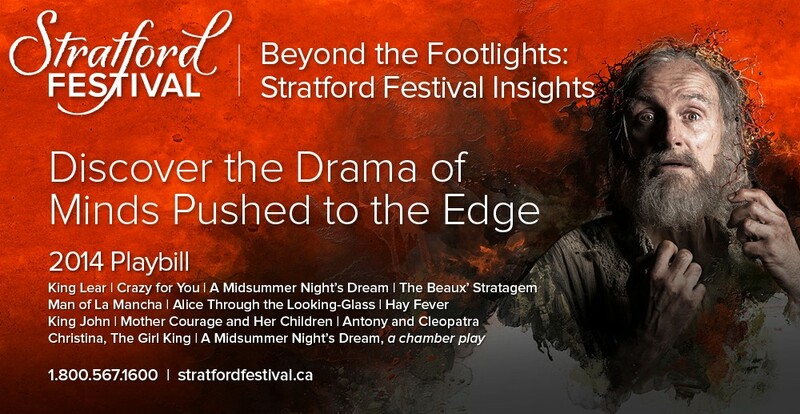 The Stratford Festival’s 2013 season features Romeo and Juliet, Fiddler on the Roof, The Three Musketeers, The Merchant of Venice, Tommy, Blithe Spirit, Othello, Measure for Measure, Mary Stuart, Waiting for Godot, Taking Shakespeare, The Thrill and more than 150 events at The Forum. To purchase tickets, contact the box office at 1.800.567.1600 or visit stratfordfestival.ca. On May 16, my Grade 6 class from Runnymede Public School made the journey via subway to First Canadian Place in downtown Toronto to participate in Pinballapalooza. Pinballapalooza was an event organized by the Stratford Festival to promote this season’s production of Tommy. Since a big part of the play revolves around pinball, it made sense to use pinball, and Pinballapalooza, to promote Tommy. When we arrived at First Canadian Place, it didn’t look like anything major was happening on the outside, but when you entered the building you could see that Pinballapalooza was there because of all of the signs advertising Tommy and the pinball machine sounds coming from the lobby. Once we were inside you couldn’t miss it as the pinball machines stuck out like a sore thumb in First Canadian Place. It was very intense and there were a hundred pinball machines being used at once. Everyone was paying so much attention to their pinball machines that you rarely ever heard people talking. All you could hear was the dinging of the pinball machines and clicking of the flippers. There were all kinds of pinball machines there with the themes from Lord of the Rings and Avengers to Metallica, Spider-man, AC/DC, The Simpsons and Avatar, to name just a few. Just before they attempted (and succeeded in) the world record for the most people playing pinball at the same time, there was a preview concert where the main actors performed some of the songs from Tommy, such as “Pinball Wizard.” A lot of the kids in my class really like The Who, so they were very excited to go and listen to the songs – especially my friend Jack and my teacher, Mlle. Walker. Before the concert, they had even taken the time to install a few rock concert-style lights that flashed and spun while the musicians played. Once it was time to go, everyone in my class was disappointed since we all wanted more time with the pinball machines. The event itself was really fun but I’m just glad that I wasn’t part of the setup crew that had to carry all those pinball machines in and out of First Canadian Place! A special thanks to the Stratford Festival for inviting my class to Pinballapalooza and to my teacher, who organized the excursion and let my class go to Pinballapalooza! 12-year-old guest blogger and theatre enthusiast, Adam Leung, joined us for Pinballapolooza in Toronto with his Grade 6 class on May 16. Stay tuned for Adam’s reviews of Romeo and Juliet and Fiddler on the Roof. Enjoy other blogs by Adam here. May 17, 2013… The Stratford Festival is officially home of one of the newest GUINNESS WORLD RECORDS. One hundred “pinball wizards” took over First Canadian Place in Toronto yesterday to successfully log the greatest number of pinball machines being played simultaneously at a single venue. At 12:40 p.m., participants synchronically launched their silver balls and played one complete game as hundreds of onlookers cheered from the sidelines. The record was made official by GUINNESS WORLD RECORDS adjudicator Philip Robertson. An exciting event to celebrate the opening of the Festival’s much-anticipated rock musical, Tommy, Pinballapalooza also featured spectacular performances by Tommy cast members Robert Markus, Paul Nolan, Gabriel Antonacci and Matthew Armet. 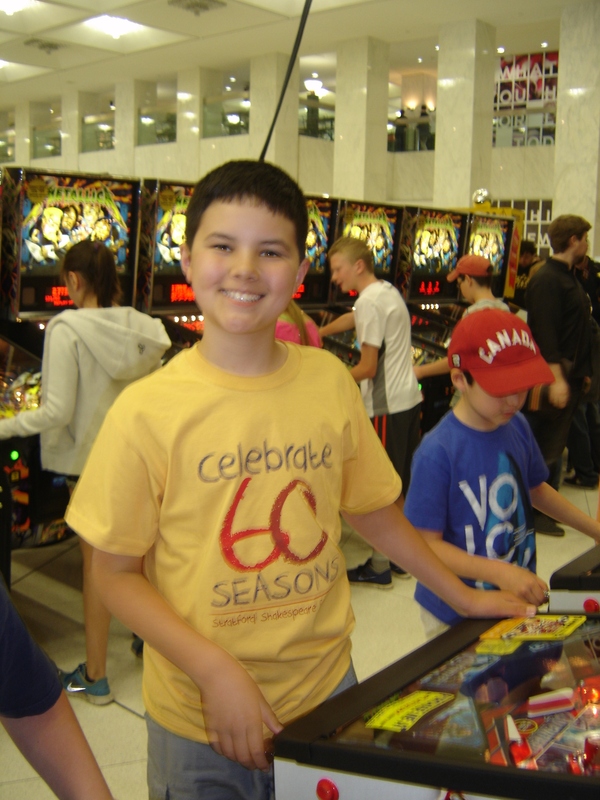 “Tommy is the biggest musical we have ever mounted in Stratford,” says Executive Director Anita Gaffney, “and what better way to celebrate it than by throwing a larger-than-life pinball tournament that would impress even Tommy, the pinball wizard himself. For those who could not attend, the Festival offers two other opportunities to practise your pinball moves: a Tommy-inspired pinball machine found at different locations in Stratford throughout the season and a virtual pinball game at tommypinball.com. The production features Robert Markus as Tommy, Jewelle Blackman as the Gypsy, Kira Guloien as Mrs. Walker, Jeremy Kushnier as Captain Walker, Paul Nolan as Cousin Kevin and Steve Ross as Uncle Ernie. Choreographer Wayne Cilento, Set Designer John Arnone, Costume DesignerDavid C. Woolard and Fight Director Steve Rankin, key members of the original creative team, have reunited for this production to join Musical Director and Supervisor Rick Fox, Lighting Designer Howell Binkley, Sound Designer Andrew Keister, and Projection Designer Sean Nieuwenhuis. Tommy officially opens on May 30 and runs until October 19. For tickets, contact the box office at 1.800.567.1600 or visit http://www.stratfordfestival.ca. Tommy is sponsored by Ontario Lottery and Gaming Corporation. Production support is generously provided by Richard Rooney & Laura Dinner and by the Ontario government. Support for the 2013 season of the Avon Theatre is generously provided by the Birmingham Family. Stratford Direct, the new daily return private bus service between Toronto and Stratford, began May 1. Departing once daily from May 1 to 25 and October 1 to 20 and twice daily from May 27 to September 29 (on performance days only), the round trip costs only $20. Support for Stratford Direct is generously provided by The Peter Cundhill Foundation. 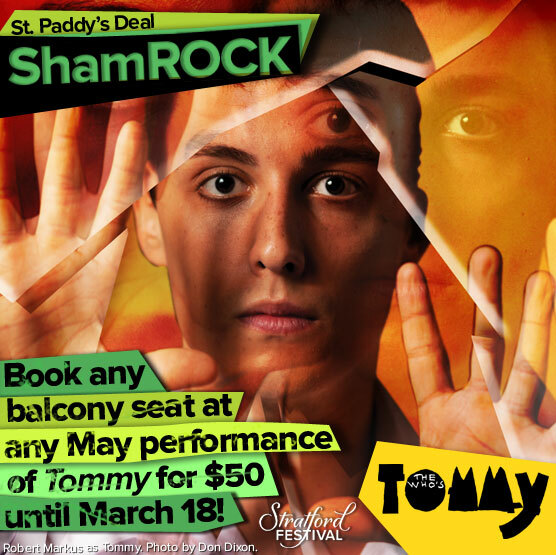 St. Paddy’s Day ShamROCK deal – Enjoy $50 tickets to Tommy! We’re celebrating St. Patrick’s Day with a shamROCK of a deal. Today until March 18 at midnight, book any seat in the balcony at any May performance of Tommy – The Who’s epic rock opera – for just $50! Deprived of sight, hearing and speech by the shock of what he has witnessed as a child, young Tommy Walker seems lost to life – until he reveals an uncanny talent for the game of pinball. When his faculties are suddenly restored, Tommy is hailed as a living miracle – but will the fans who turn to him for enlightenment want to hear what he has to say? Here’s what you need to do to take advantage of this limited-time offer! Enjoy this shamROCK of a deal and have a safe and happy St. Patrick’s Day! P.S. – If you’re in the Toronto area on May 16, join us for a Pinballapolooza! There will be 100 pinball machines set up for free play – so challenge yourself and others in the world’s largest Pinball play! Take a break from playing and enjoy a VIP concert with the incredible talent from our production of Tommy – hear your favourite songs and get a taste of our larger than life production. *Offer is only available online until March 18 at midnight and cannot be combined with any other offers or on previously purchased tickets. Promotion can only be redeemed online through Stratford Social Ticketing on the Festival’s Facebook page. Some conditions may apply. Be the first to get an inside look at our productions and be informed of what's going on at the Festival throughout the season. Subscribe and explore the Festival with us!